"Ride the free river of Vindel´n"
This is a two-day ride in the high mountains of the spectacular Vindel range, one of Europe’s largest protected nature reserves which covers some terrain where almost no man has ever set foot. We overnight in an old pioneer place "Aitelnas viste" - a jewel amongst jewels. Possibility to extend the holiday with 1 - 3 days before and do half or hole day tours in the area. Please e-mail for information, other activities and price. Possible to Extension of tour: arrivel day: monday, tuesday or wednesday. Please e-mail for further info. Arrivel to Ammarnas in the afternoon/evening. You spend the night in Ammarnas, on Hedebo farm in shared accommoadtion. Meals are not included. 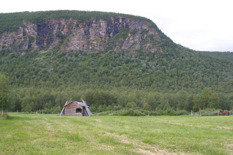 We start 09.30 am towards the old pioneer place, Aitelnas viste, a very old cabin from the 1880s. 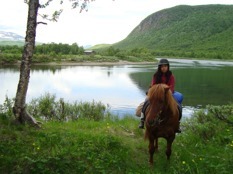 Horseback riding along the free water of the river Vindel´n. Aitenjas viste lies in the mountain valley, very beautiful under the steep slope of the mountain hillside and along the shore of the river Vindel´n. The fine sandy beaches welcomes you to try a dip in the crystal clear and shimmering green, but cold mountain water. Breakfast (prepare on one's own), lunch & dinner are included in the basic price. 17 km / 3-3½ hours in the saddle. 25 km / approx. 5-6 hours in the saddle. OBS! Movies taken from the horses back...not the best quality!! 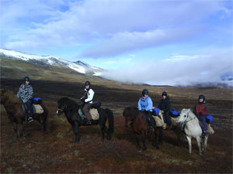 Departures Wild at heart 2 "Ride the free river Vindel´n"
* Minimum 2 and maximum 4 participants on the tour.